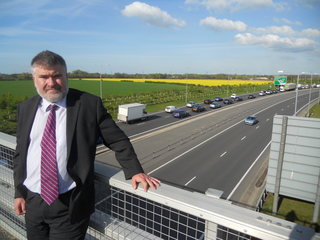 Highways England has today announced the preferred route of the new dual carriageway between the Black Cat Roundabout and Caxton Gibbet and the preferred new configuration of the Black Cat roundabout, and Mayor Dave Hodgson has responded by calling on the agency and on the Government to ensure there are no further delays for this crucial project. Today's announcement comes two years after the public consultation on the options for the remodelled junction and new section of road, while the 2021/22 start date for the project has already been subject to what Mayor Dave has described as an 'appalling' two-year delay. "Today's announcement is a welcome step in the process, and I'll keep pressing Highways England and the Government to ensure this vital, long-promised project is finally delivered." "- The Black Cat will at last be 'grade separated', separating the A421 and A1 from the roundabout itself (via slip roads), with the A1 going underneath a new enlarged roundabout and the A421/8 going over the top. - The chosen route of the road is the one which most closely follows the existing route. Crucially, by filling the gap between the dualled sections between the Black Cat and Caxton Gibbet, the project will mean that if you're heading east there will be no need to join the A1 for a short stretch and then come off onto a single carriageway A428, and instead you will be able to continue on the dual carriageway."